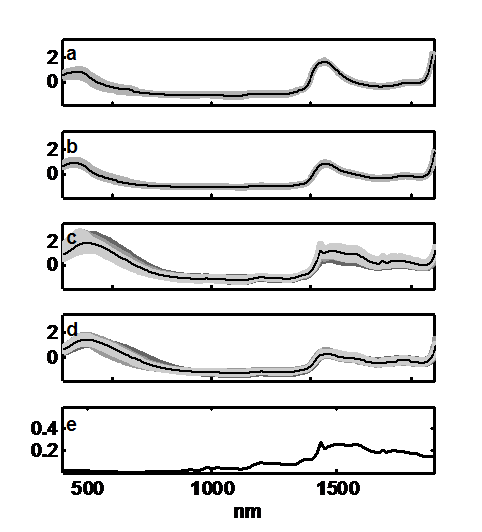 NIR spectra for prediction of Brix and sucrose during sugar production. Data originates from four process steps in a sugar factory: milling (juice), evaporation(syrup), crystallization (massecuite) and centrifugation (molasses). The latter two steps consistedof three sub-steps. 1797 samples were measured at 400 – 1888nm with an increment of 2 nm.The reference values Brix (dissolved solid content) and pol (sucrose) were measured as mass percentage. The dataset contains nonlinear effects due to changes in the physical and chemical constitution of the process stream during production such as temperature, pH, viscosity, sample composition and crystals. Spectra of a) juice, b) syrup, c) massecuite d) molasses and e) sucrose. Data no longer available. We apologize, the the original owners of the data, have withdrawn their permission to share the data. Thus, we can no longer share the data. We apologize sincerely for the inconvenience (April 2017).